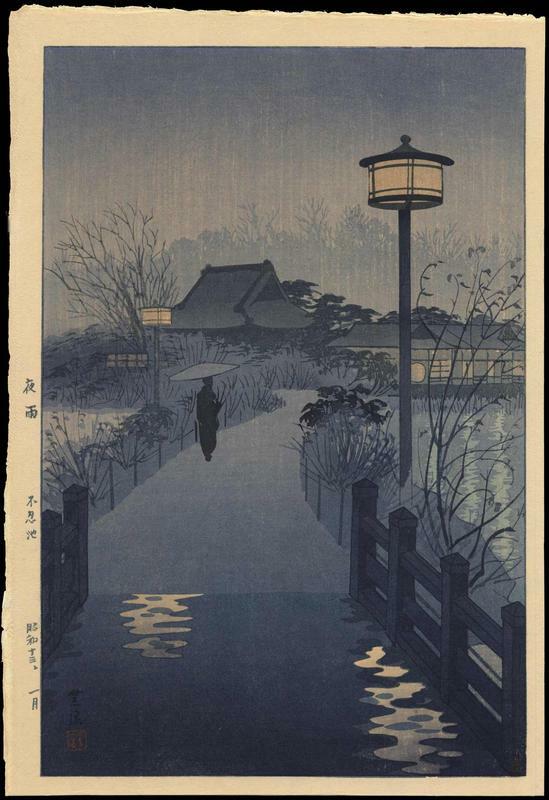 Kasamatsu, Shiro (1898-1991) "Evening Rain, Shinobazu Pond" - Woodblock - Chinese and Japanese woodblock prints for sale, silkscreen, scrolls, watercolor, lithographs. Artwork Details for Kasamatsu, Shiro (1898-1991) "Evening Rain, Shinobazu Pond"
Condition: Fine impression and pristine condition. Rare to see prints of this vintage in such fine condition. Appears to have never been framed. Full margins. No tears, creases, folds, foxing or stains. Notes: One of Shiro Kasamatsu's most popular prints. In the left margin are title and date. Kasamatsu red seal and black signature at bottom left of image. Bears early Watanabe 6mm seal.